The cat ran around the pitch for nearly three minutes without being chased by any security. Animal invasions at soccer games isn’t that uncommon. Last week, a possum entered the pitch during a Liga MX game in Mexico and there’s countless stories about dogs and cats getting on the pitch trying to have a bit of fun during a game. 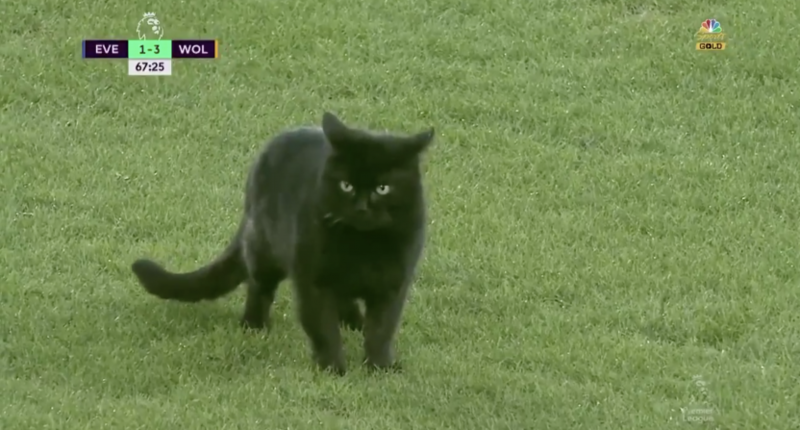 Today, a black cat trotted on the pitch at Goodison Park during Everton’s game with Wolverhampton Wanderers. And the way this feisty feline was moving, they were showing the home team how it’s done. After some incredibly slow reactions by security, who seemed cool just letting the cat run out there all day, the kitty ran all around the pitch for nearly three minutes. It dominated both ends of the box like a skilled defender and then flew to the other end and showed its skill as a box-to-box midfielder. Then to finish off its showcase to the world, the cat got to goal like a powerful striker who always gets the ball in the back of the net. After showing up every Everton player, the black cat ran off into the tunnel without being bothered by security. Everton would lose to Wolves 3-1 and the cat was probably the best Everton player out there today. So at least the home fans got something remotely positive about the game that they could talk about.